It might sound easy to fry up chicken—but the real masters know it’s an art form. Whether it’s Grandma’s decades old recipe or a modern concoction, making fried chicken that people want again and again is no simple task. In Kansas, we’re serving up some of the most mouthwatering options you’ll ever try. Here are the 10 best places for fried chicken in the state. Stop by JD’s Chicken in Hays and enjoy some of the best fried chicken around. Good food and a great staff will make it worth the trip. You’ll want to come back again and again! Enjoy some of the best chicken ever fried at the Hays House Restaurant in Council Groves. 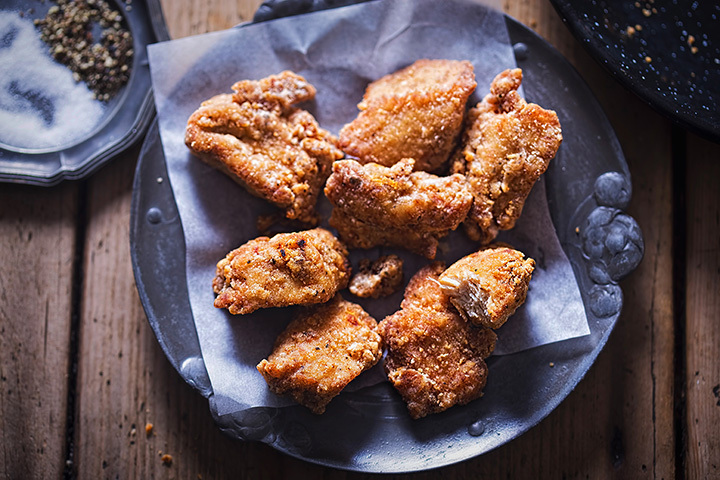 They fry their chicken the old-fashioned way in a cast iron skillet! They serve America’s favorite fried chicken at Cattleman’s Café II in Liberal. This fried chicken is some the best in southwest Kansas. The Down Home Family Restaurant in Independence fries up some tasty “chicken fried chicken.” And the rest of the menu selection is tasty too! Cooks’s American Grill in Topeka will serve you some great fried chicken. And it doesn’t matter if it come to you served on a dinner plate or between a bun. Yummy! Everyone needs to try the Hometown Café in Barnes, because they serve a good ole’ plate of homecooked fried chicken. It’s the special of the day on Wednesday! Russell’s Restaurant in Salina serves delicious fried chicken with great sides. On the days it is the special-of-the-day, you can get the best fried chicken and some of the other chicken parts not usually served—livers and gizzards! At Carolyn’s Essenhaus in Arlington they serve their fried chicken, pan fried, and it’s served all-day-long. Crispy, hot, and juicy pan-fried chicken is the best. The Sommerset Hall Café in Dover serves wonderful entrees on the menu, but make the drive on the night they serve fried chicken and all the fixings on their buffet. Excellent chicken, prepared and served by friendly staff. Visit Carriage Crossing Restaurant & Bakery in Yoder and get ready for the best, hand breaded, golden crispy fried chicken you might ever taste, ever!